In 1764, Thomas Olney established one of the first mill privileges along the Woonasquatucket River. Through the rise and fall of industries and technologies, we now have the Rising Sun Mills . The complex is named for the paper mill Olney’s son built and operated until the early 1800s when it was sold and converted into a textile mill. 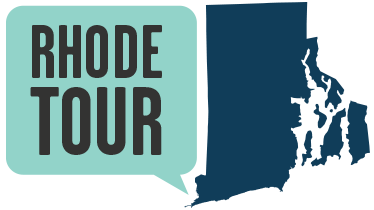 Although Rhode Island’s textile industries had originally been based on cotton manufacturing, by the mid 19th century, woolen production dominated. The blockade of southern ports during the Civil War cut the supply of cotton to New England’s textile mills, pushing many local manufacturers to produce yarns and cloths from local and imported wool. Soon there was a new market for worsted wool. Coats, suits, and cloaks made of worsted cloth had a smooth texture and sheen, a look that the public took to with gusto. Worsted fabrics were also highly desirable for military uniforms. Capitalizing on the trend, Providence became the largest producer of worsted goods in the country by the 1880s. 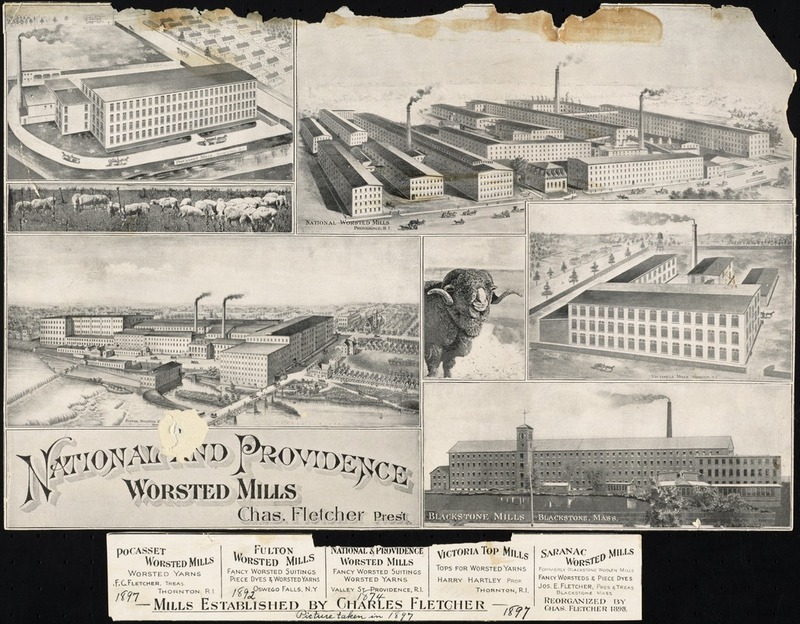 Jumping into the growing industry, Charles Fletcher bought the property in 1875 and converted the old paper mill building into a bustling yarn factory named the Providence Worsted Mill. In the volatile boom-and-bust business climate of the late 19th century, the textile industry consolidated to stay competitive. In the mid 1890s, the Providence Worsted Mill merged with the National Woolen Company to become the American Woolen Company. As Fletcher continued to add buildings to his yarn-making complex, his business expanded to produce a range of fabrics, not only woolens. Eventually, Fletcher incorporated his woolen and cotton textile factories to form the National and Providence Worsted Mills. At its height the company employed 750 workers, produced 900,000 yards of worsted goods yearly, and became the largest single consumer of wool in the United States. The mill closed in the 1950s, along with many New England textile factories, as the industry moved south in search of a non-unionized work force. Oversized, distinctive mill complexes like Rising Sun stood empty and underused as Providence’s once mighty industrial base of textile and machine-tool production dispersed. Fortunately, mills like Rising Sun have more recently become beacons of innovation and adaptive reuse. Rising Sun, for example, is now home to 135 residential lofts, 120,000 square feet of corporate and professional office space, and houses architects, designers, software and pharmaceutical firms, and a yoga studio. In 1976, spurred in part by the nation’s Bicentennial, the City of Providence took action to protect the old mill buildings as part of the city’s distinctive heritage. Efforts like these resulted in the Historic Preservation Act of 1981 and the Urban Mill Restoration and Tax Exemption Act of 2002, both of which brought a fresh perspective to the old buildings and their placement on the river. The Armory Revival Company has remade the Rising Sun Mills into a contemporary apartment complex. Watch this promotional video to see how good an old industrial mill can look! 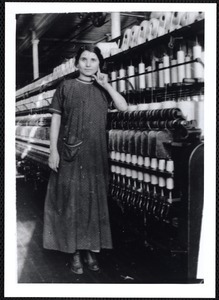 Jane Gerhard, “Rising Sun Mills,” Rhode Tour, accessed April 21, 2019, http://rhodetour.org/items/show/222.